It was an amazing day for UB football. It started with them breaking ground on the new field house and ended with them playing the longest and highest scoring game in FBS history. UB dropped a 71-68 7OT contest to the defending MAC champs Western Michigan Broncos. 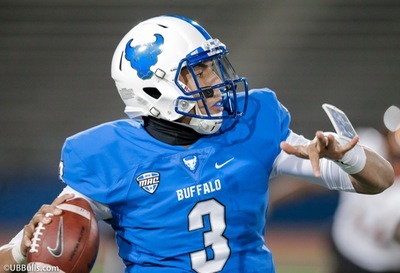 It proved that UB could hang with the best teams in the conference. It proved that Drew Anderson is one heck of a QB. 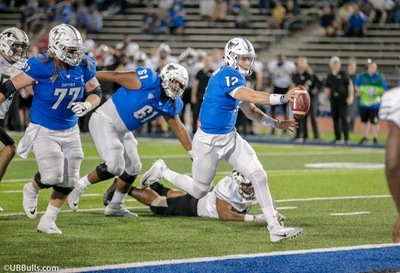 Anderson set MAC records with 597 passing yards and 7 touchdowns passes. He ran for another score so he had 8 touchdowns on the day. Coach Lance Leipold has a tough decision to make in the upcoming weeks. Does he sit Drew Anderson when Tyree Jackson is healthy to play? Three Bulls receivers went over 100 yards in the game. Anthony Johnson was again a man amongst boys. He had 11 receptions for 195 yards and two touchdowns. Kamathi Holsey and KJ Osborn had their best days receiving. Holsey caught 6 balls for 143 yards and a score while Osborn caught 7 balls for 138 yards and three touchdowns. Injuries are a concern coming out of the contest. RB’s Emmanuel Reed,Theo Anderson and WR Jacob Martinez all left the game and were unable to return. The offensive line is becoming a true strength of the team. Anderson dropped back 61 times in the game and wasn’t sacked once. The Bulls are home again next week at UB stadium to take on another MAC power in Northern Illinois. After Thursday night you can stick a fork in Lamar Jackson winning the Heisman Trophy this year and joining Archie Griffin of Ohio State as the only back-to-back winners. NC State won the game 39-25. Louisville struggles against good defensive lines. Bradley Chubb of NC state impressed again with his consistent pressure on Jackson. Jackson is getting little if no help from his line or his inexperienced receivers. Jackson was 26 of 47 for 354 yards with a touchdown. He was the team’s leading rusher again with 73 yards and two scores. He’s basically a one-man show. His pick six at the end of the game was a pass he threw behind the receiver. Although he won’t win the Heisman, he still could be a QB drafted in the first or second round of the NFL draft. Ryan Finley of NC State is a QB to keep an eye on. He hasn’t thrown an interception all year long. He seems very efficient in the 3 and 5 step drop game getting the ball off on time. I can see NFL teams liking what they see from him so far this year. Memphis destroyed UConn Friday night 70-31. QB Riley Ferguson threw seven touchdown passes. Four of them went to Anthony Miller. Earlier this year these two were impressive in an upset win over UCLA in front of a National audience. It was a nice bounce back performance for the Memphis offense that struggled last week against a very good Central Florida team. Late this week Iowa State starting QB Jacob Park left the team for medical reasons. Kyle Kempt a senior who had only thrown 2 passes in his career took the Cyclones into Norman, Oklahoma and led them to a 38-31 upset. Kempt passed for 343 yards and three touchdowns. The Cyclones hadn’t beaten the Sooners since 1990. Oklahoma was ranked third in the nation and it snapped the nations longest 14 game-winning streak. The Cyclones after the game took a page out of Sooners QB Baker Mayfield’s book by planting a flag in the center of the field. Mayfield had done that earlier this year when the Sooners won at Ohio State. Another top 10-team lost at home to an unranked opponent. Michigan lost 14-10 to intrastate rival Michigan State late Saturday night. Michigan looked awful in the game making far too many mistakes. The Wolverines had five turnovers and several costly penalties. MSU jumped out to a 14-3 lead midway through the second quarter and held on the rest of the way. The Spartans and Wolverines are both 4-1 on the season. Will Grier of West Virginia looked good throwing for 366 yards and 3TD’s in the Mountaineers close lose at TCU 31-24. Sam Darnold threw for 316 yards and 3 TD’s in the Trojans 38-10 romp over Oregon State. Darnold turned the ball over two times. Turnovers have been a theme for Darnold this year. Luke Falk threw for 282 yards and three touchdowns as Washington State blew out Oregon in Eugene 33-10.